I feel really lucky that Laurie Wisbrun gave me the opportunity to work with her new fabrics, and I had tons of fun making the quilt and pillow I shared yesterday. I knew I wanted to make something to giveaway with the rest of the fabric, so I made this strip quilt for Project Linus. It is 41 x 52 inches. Strip quilts are easy to make and sew up so quickly. They are great for featuring fun prints, like these polar bears. Add some straight line quilting, and you're good to go. Easy and cute, they are a great option for making quilts for little ones. I hope this is just the first of several quilts I can donate this year! And that's not all I get to giveaway today! 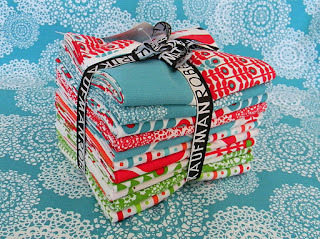 The folks at Robert Kaufman gave me a fat quarter set of the full fabric line to give to one of you. Just leave a comment, and I'll select a winner, randomly, Monday morning. If I can't contact you via a valid email address, I'll choose another winner. Good luck! Contest now closed. I feel a burning need to send bears into space. Or more likely build a fortress for them in Candyland. Wow - fabulous giveaway! This fabric is soooo cute - LOVE it! Oh my gosh, what a giveaway! I hate that I'm No. 3 or so. That never wins, does it? Thanks for the chance! I was so anxious to sign up that I forgot to see if there's a question I'm supposed to answer, argh. What a cute line of fabric! Thanks for the giveaway. What a fantastic giveaway! Thanks for the chance! My kids would definitely like the prints. I love the snowflakes, myself. Good for you making one for Project Linus!! ooh! how exciting :) thanks for the chance to win and the quilt is lovely! 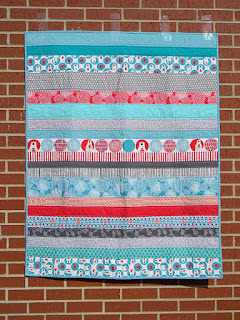 I've been ogling this fabric since it started showing up on blogs and would LOVE to win some! That's a beautiful quilt to give away. I hope to make several quilts for the Pro-Life Society this year. Oooh, awesome giveaway. Thanks for the chance. 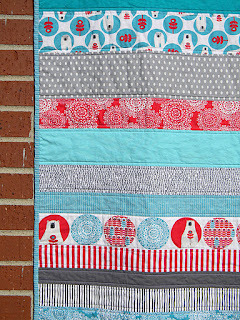 I saw an adorable Swoon block made from two of these fabrics--amazing! I'd love to see the rest of the line. In person, of course!! hahaha! These fabrics are pretty amazing. That polar bear just looks like he wants a Coke. Where do you drop off your Linus quilts? This fabric is so dang cute! I love the colors. I hope I win but if I don't I'm sure a bundle of this will find it's way to my house. This looks like such a fun line. Thanks for the chance! I would have left a comment anyway, because I love that little polar bear peeking out of the square on the back. Those polar bears just. slay. me. I love your quilt and this fabric line. Thanks for the giveaway! Your quilt turned out amazing and thank you for the giveaway!!! are you kidding me?? ack!! so exciting! the strip quilt is adorable. i love that you are involved in project linus. i have been here in VA, too. This is the cutest fabric! Thanks for the giveaway! Oohhhh, that fabric is adorable! Greate giveaway ! Love the fabric. Thanks for a chanse to win. Great giveaway! This is such a cute line! Your projects have been great! SO cute! I'd have a hard time deciding how to use those quarters! Gorgeous quilt, this fabric is lovely, thanks for the giveaway! Love the matching scrappy back you made! oh gosh, i am partial to red, white and aqua and that fabric is stunning. 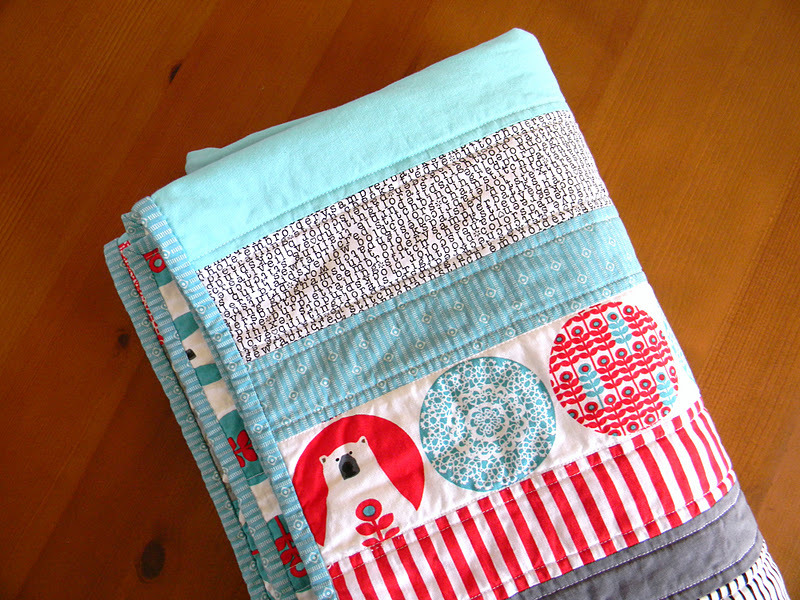 really cute easy quilt, thanks for sharing. What a sweet quilt! I love the back! WOW! What a wonderful giveaway and my favorite colors, too! I sew Quilts for Kids, too, and love the strip quilt you made. I'll have to try that, as well. Looks like it works up quickly, which will give me time to make more! OMG!!! I LOVE this fabric line and would throw elbows and claw eyes to get my hands on some! (lol, just kidding!). But seriously, polar bears are one of my favorite animals and I'm completely obsessed with this line. Crossing my fingers I win! Thank you for the giveaway! The colors are Wonderful and bright for a baby. I thought it was hardly worth commenting for a FQ. But, than I saw the fabric. I love strip quilts and the fabric is perfect. So thanks a lot when I win. 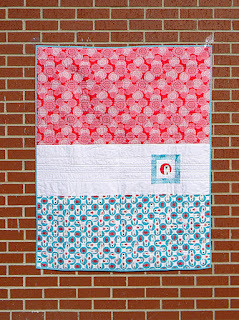 Your quilt is just lovely, and I LOVE that it is going to Project Linus! My son got a PL blanket when he had open heart surgery. That's a great org. That quilt is incredibly cute, my little boy would just adore one like that! would love to make a quilt with this line......... I just found out I am going to be a Gramma again!! Woohoo!! I think a quilt for charity from those fabrics is a wonderful idea. Those are wonderful. Thanks for the Giveaway. Ooooh that is such a wonderful prize! Thanks for such a great giveaway! What a sweet idea to make one to give as well. Lovely! What a great give away! I'm from Ontario and never seem to win these give always!! Can't blame me for my continued efforts RK has amazing prints! What a cute line! Gorgeous quilt too... i'd love to win so I can make one for my goddaughter! I would love to have this FQ. I LOVE Laurie Wisbrun, and I love the projects you made with this line. Thanks for the giveaway! I think the fabric is wonderful. I have two new great nephews and need to make something asap, maybe I will get lucky. I would love to win these! Stunning fabric! thanks for the giveaway - such wonderful colors ! Thank you! I can't wait to get my hands on some of this adorable fabric! Thanks for the giveaway - it is such lovely fabric! Wow. Fantastic giveaway. The fabric colours are lovely. Your quilt is just adorable, l love it. I love Brr, and I love your quilts! Thanks for the giveaway! A few strip quilts for Project Linus are on my "make" list for this year too. Must use the scraps and stash! I love the new prints!! that Linus blanket is just too cute. The fabric colors are fabulous! I do charity quilts also, I try to focus on doing "boy" quilts. This bundle would make a great boy charity quilt. I love it. I <3 these fabrics! Bears in space - so awesome! I am just loving the Brrr! I have been seeing around. Which is strange for me, I normally don't gravitate towrds red, ever. Cute quilt!!! I am starting to fall in love with this polar bear I keep seeing. I love that you created something for project Linus!! These fabrics are so fantastic. Thank you for the chance to win! These are ust beautiful fabrics and I'd love to win theme. Thank you. Such a fun quilt! You're going to make someone very happy with your donation. Love the quilt - what fun fabric! Thanks for a great giveaway. I love the fabric and your quilt is so cute. LOVING this fabric! Can't wait to get my hands on some. Love that Polar Bear! Thanks for a chance to win some BRRR! Thanks for the give a way. I love that fabric line!!! Great collection. Thanks for the chance! Wow! love this giveaway! Thanks for having it. Great fabric, thank you for a chance to win some for my very own. It's a beautiful quilt, I love the fabrics. I'm so happy to hear it is going to be loved by someone in need. I haven't started quilting yet, but when I do, I'm definitely going to be donating some. I've been seeing these wonderful Brrr! fabrics all over the internet. I love them and would love to add some to my stash. Fun fabric and a great pattern to showcase it. Thanks for the chance! such a great fabric line! i need to do more charity quilting too... we received a linus quilt when our son was a baby and it made me want to learn to quilt so i could give back some day! Love this line!! Thanks guys! love this fabric line - little polar bears in the circles perfect for fussy cutting. I Love your work and love to follow your blog and nice inspirations. Love the projects you made with this fabric, would love to make some too! Thanks for the chance! I'd love some Brrr! (Fabric that is that since I do not like the cold weather.) Thanks for the chance to win some. What a great fabric line! I'd love to win some! Red and aqua for Christmas. I love it! wonderful fabric .. thanks for the chance! that line is perfect for a strip quilt! thanks for the opportunity to win. Fun, fun, fun! Here's hoping I win! Loooooove that fabric line. My favorite color combo of all time! The strip quilt is gorgeous. I am sure it will keep someone very warm, and happy! I'd love to win these lovely fabrics, and continue with my baby quilt making, but right now my sewing machine is in the hospital!! WAAAAA! Love those colors! Your quilt is so sweet. The quilt is lovely, I'm sure there'll be a very happy recipient for it. The polar bears are so adorable. Love your quilt! And the Brrr! collection. I'd love to win this! Giveaways are exciting, but even moreso is the inspiration you provide here. 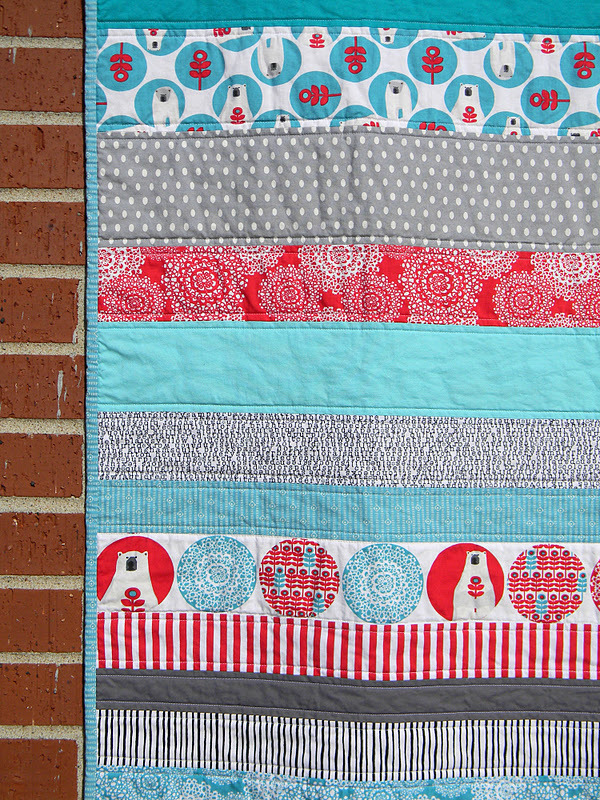 Love the strip quilt you made with this fabric! I'm new to quilting (and stash-building!) so Thanks for all that you share! Wow, would love to win that bundle of goodness! 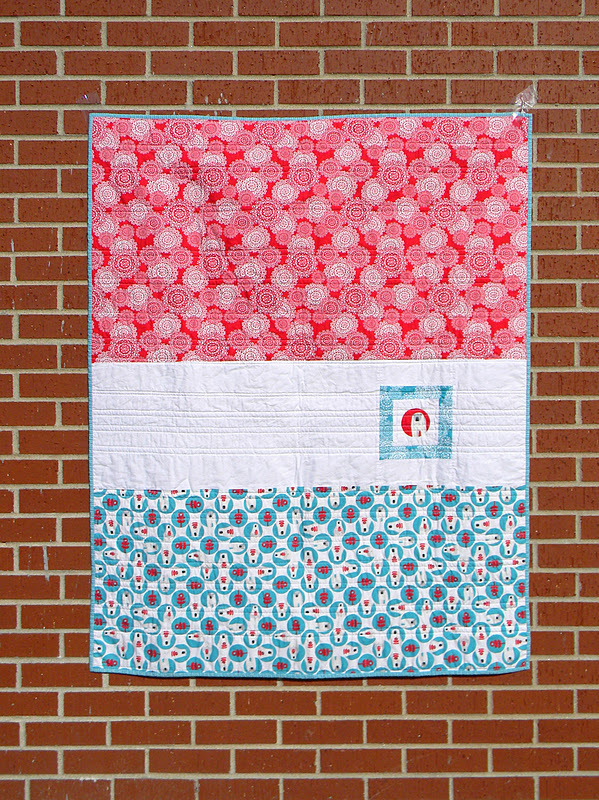 That would be such a cute Ronald McDonald quilt I could donate to our quilt guild! Thanks for the opportunity to participate in a fun give-a-way! I am a diehard LW fan! Pick me! Ooh great giveaway!! I'd love to win that fabric. I really loved Laurie's Pooches and Pickups line and this line looks so cute too! I love a great giveaway, and that pillow you posted the other day must get done! your project linus quilt is super cute! I grew up on a farm and our home town was (is) White Bear, Saskatchewan. As soon as I saw this fabric line, I just KNEW I'd have to get some one way or another. White Bear is all but a ghost town now. Just a handful of people live there. It really dwindled after the rail line quit running through. My Mom just LOVES anything with a polar bear on it. You'll have made some lucky (or luckier) Linus happy! brrr! would be perfect for that christmas tree skirt i *swear* i'm going to make this year! Thanks for the giveaway! I'm thinking this would look great in a swoon quilt for next Christmas (I realize it's probably a little early to be planning). This line is so cute, i would love to make a quilt for my daughter! 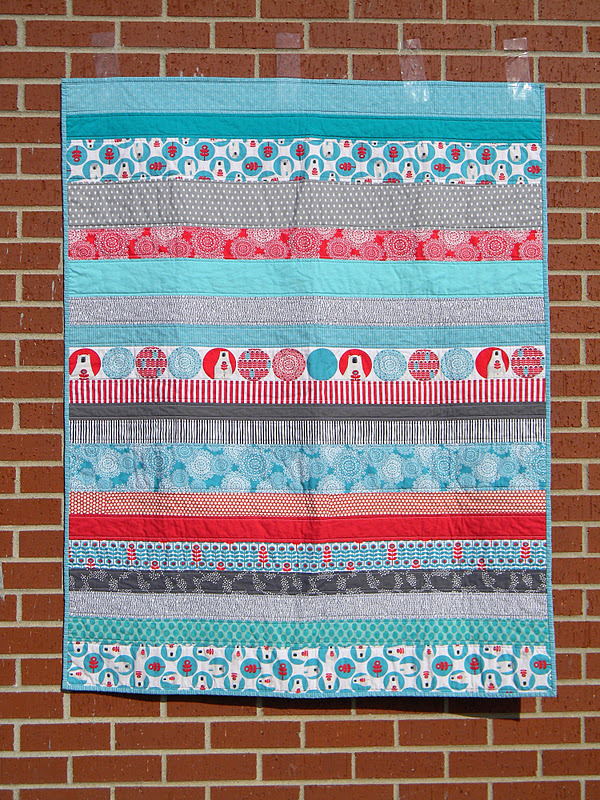 That quilt is so darling, strip quilts are easy to make, but it's hard to make them look awesome - this one is great! Those polar bears were just crying out for a rocket ship to get them to the moon, what a lovely set of fabrics, perfect for a child, whimsical for an adult. What a great giveaway! I love this Fabric!!! Love the quilts you have made from these fabrics - so cute and colourful! I absolutely love this fabric, thanks for the chance to win! very cute fabric - I would love to win. So so lovely! Love the background of the last photo...bit of a sucker for snowy stuff cos I where I live I never see it! Adorable fabric! Your quilt looks great! AND it's a super cute quilt. The little bear on the back totally does it for me! The Brrr fabrics are adorable! I love the quilt you put together. Love ye quilt and love this line of Laurie's ... pick me Mr random ...please!! It's brrrrr here in brrrrighton!! I love this fabric. I would make a quilt for my sisters baby. What a great giveaway! Super cute line. Love this line. can't wait to work with it. I am in love with those polar bears. They want to come live in sunny Ca with me. Love that fabric line but what I love most is that the quilt goes to project Linus!!! Love this fabric and all your work with it. That rocket ship pillow is too cute! what a fun giveaway! nice of you to share!!! Thanks for the giveaway! I have never seen those fabrics but they are soo cute! Your quilt choices were great for the fabric! I can't wait for that line to come out. Doesn't Laurie always design the cutest fabric? And you are right, a strip quilt is perfect for those polar bears. I love this line of fabric! Strip quilts are so fun and easy to make. Some little one is going to adore that quilt! What a lovely quilt, simple can really shine with the right fabrics! Such a cute quilt! I think I'll do the same if I win the FQ set! Cute, cute fabric! Love the colors.